The layout was built as a competition entry that must not exceed four square feet. The actual baseboard measures 38 inches x 15 inches and the fiddle yard is 24 inches long and 8 inches wide. The whole thing then sits on an ironing board. The track plan is very simple and is supposed to be a terminus on a large farm estate railway. The track is code 100 with about a third of the sleepers removed and re-spaced to give a more rustic appearance. The points are Peco track which take up very little room. Point control is by wire in tube. At this stage I lightly pinned down the track and thoroughly tested it with a Bachmann On30 0-4-2t Porter and an 0-4-0 Davenport (these were later modified to 1/32 scale). When I was happy I ballasted and started to add layers of ground foam, I like to build this up a bit at a time. Last edited by Broadoak on Tue Apr 17, 2018 7:54 am, edited 5 times in total. The tree is made from thin telephone wire. We had a new timing system put in at work (a motor racing circuit) and there was loads of this wire going spare. I twisted the wire round itself to make a tree shape adding extra bits for branches. The whole thing was shall we say less than rigid. So I wrapped kitchen towel round the trunk and branches then soaked it in neat PVA. After a few days it had dried out and I then coated it with a thin layer of Milliput modelling putty. When this was drying I scribed it to look a bit more like bark. When this had hardened off I painted the trunk and branches a greenish grey colour with acrylics. Then I washed several coats of a very dark grey with a little black India ink added to it over the whole thing until I thought it looked right. Then I dry brushed it with light grey and glued on a whole pack of Woodland Scenics foliage. I don’t think anyone does a 1/32 scale tree. So I had little choice but to make it myself. I wanted some motive power that was a bit different from the norm, something that made a change from most narrow gauge layouts with their predominantly steam outline locos. 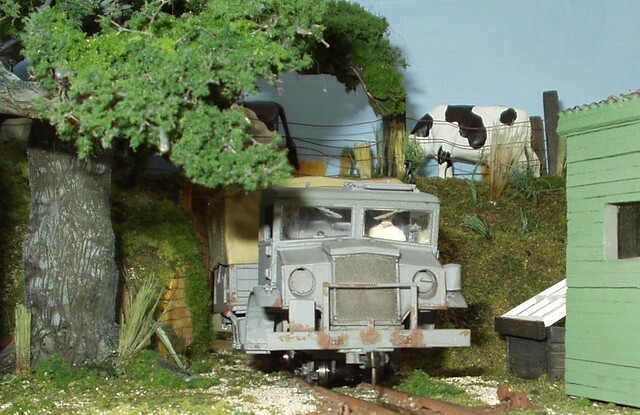 I had come across some pictures of a Bedford truck running on rails in New Zealand and this set me thinking. A trip to my local model shop saw me buying a 1/35 scale Italeri military kit of an Opel Blitz truck. I took it home and studied the parts. A germ of an idea was forming in my mind, could I get the truck body to fit over an Athearn switcher chassis? A swift check with a set of dividers suggested I could with some modifications. Consisting mainly of removing parts of the internal parts of the lorry to allow for the centrally mounted motor, fly wheels, drive shafts and gear towers to fit inside. I started with the Opel chassis and removed all the cross members, it fitted snugly against the Athearn centrally mounted motor. It was then a case of making a sub-frame of plasticard to locate the two parts together. I cut an area of the load carrying body away to allow the motor, fly wheel, drive shaft and gear tower to protrude into the truck. This was covered by a box made of plasticard so it couldn’t be seen. To get the rest of the truck body to fit meant removing part of the cab floor, the seats, part of the back of the cab, and the bulkhead between the engine and cab. The whole thing is held together by self tapping screws that go through the truck chassis and push against the sides of the motor. All a bit crude I know, but it works. Last edited by Broadoak on Wed Apr 18, 2018 5:01 am, edited 6 times in total. 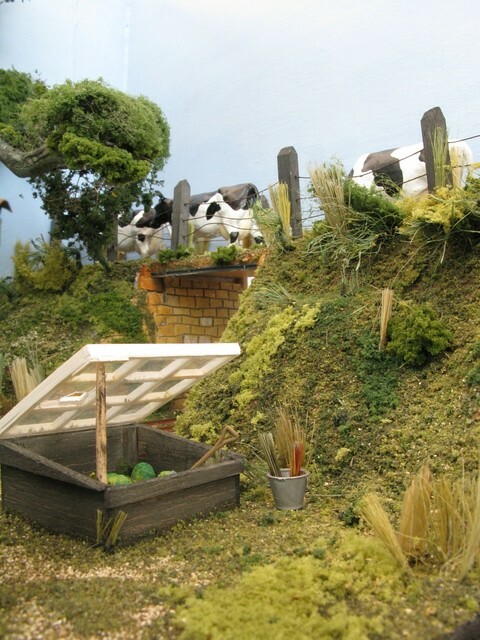 As for 1/32 scale trees the nearest is possibly the beech from Schleich which is about 35cm tall, and construction is similar to old Britains oak tree I think. Not as realistic as making your own with wire. 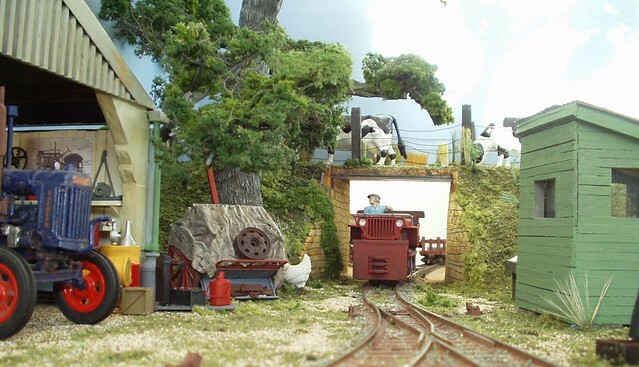 This is why I tend not to include trees on my layouts, and if I do I make time period autumn or winter (no leaves). With bigger scales problems arise with making sure large (and therefore heavy) model trees are well secured and don't fall over. A good point you have made Simon, my tree is glued to the baseboard with loads of PVA and some long grass and vegetation helps to keep it all secure. A thin wire goes through the back scene and is wound round one of the heavier branches to keep it from moving. Finally a plastic strut is fitted under another branch when the model is in transit. The tree actually weighs a little over a pound in old money. The estate that Two Sister’s is very loosely based upon had a very large green house that was used to chit the potatoes before planting. It was a quarter of a mile long and had a 2 foot gauge track running through its length. In summer tomato plants were grown, which is what I have tried to replicate on my model. The green house is made from clear, strip and angle plasticard. The brick work at the base is a Tamiya item from their 1/35 military range. The Opel Blitz ran both smoothly and slowly and was used to check clearances for the buildings I intended making. 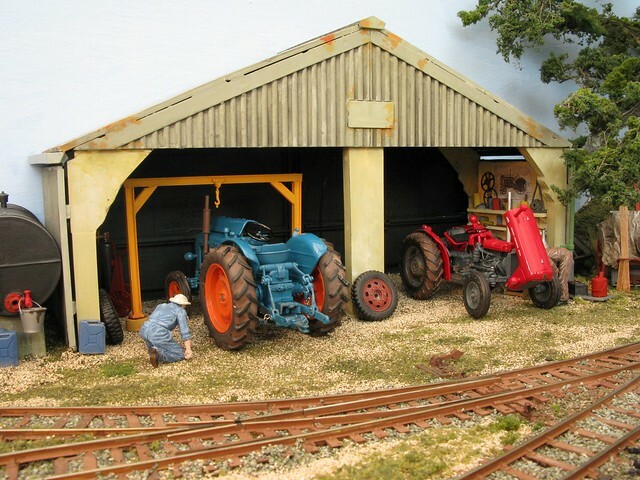 The first of these was a large asbestos barn of a type common in the 40’s and 50’s where the tractors and implements were to be serviced and stored. I made it from a child’s toy barn made by Britain’s. It came in a dark green and reddish orange coloured loose parts and was supposed to be held together with the small self tapping screws provided. I cut the whole thing up into sections and glued them together to form the shape and size I wanted. In fact there was enough material left over to make the rudimentary engine house as well. When they were assembled they were both sprayed with an acrylic grey undercoat as a base coat. The engine house was painted in a humbrol light green. The supports of the barn were hollow so I filled these with polyfiller to make them look solid. I took some photographs of similar barns to match the colours more accurately. A bridge over the tracks was made to hide the fact that it led into the fiddle yard. The green house was started and also a small foreman’s hut and a loading dock. 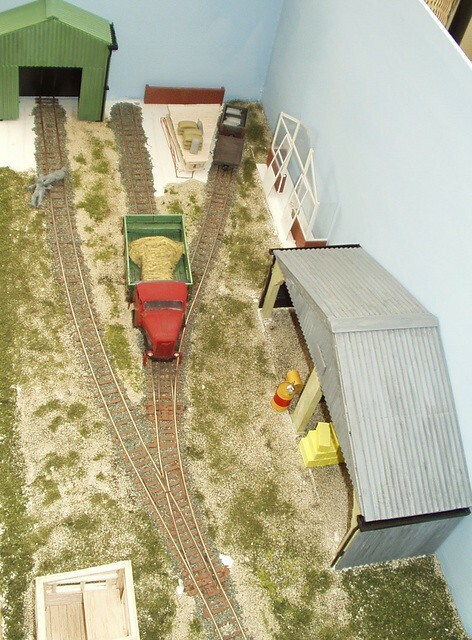 This early picture will give an idea what the layout looked like at this stage. Last edited by Broadoak on Tue Apr 17, 2018 8:10 am, edited 2 times in total. 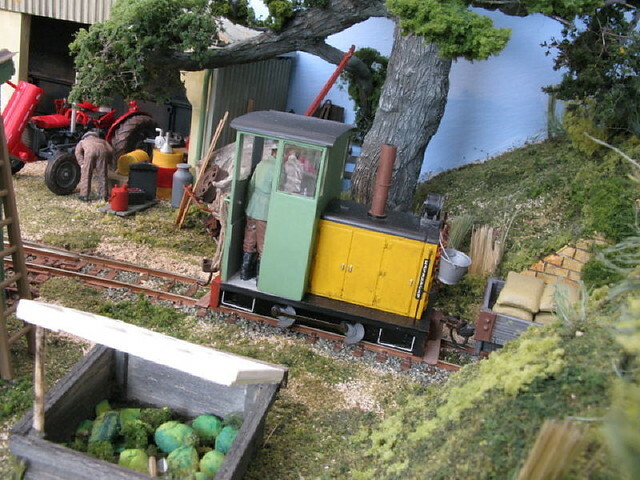 This was one of the Bedford cabbed rail tractors built in NZ by Olly Smith. Behind you can see several of his other rail vehicles including one of his rail cars. He operated three cars including a two door Anglia, a four door Anglia and a four door Prefect. He also operated a Fordson van. Thanks for that Paul, it’s a picture I’ve never seen before. I bought some Sidelines wagon kits and a small Wasp kit and collected them from Steve Bennett at an excellent exhibition in Pewsey. The little wagons went together very well and I sprayed them with grey car primer. I then gave them a thin wash of Indian ink lightened with grey acrylic. The iron work was then picked out in a rust colour. 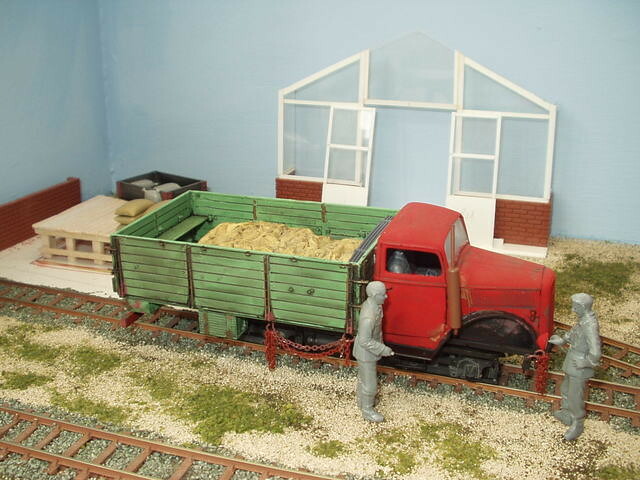 All the wagons were fitted with Kadee couplers. The Wasp loco sits on a Bachmann 44 tonner bogie and has a few details, an exhaust pipe, air cleaner and a hand rail at the back of the open cab added. It was sprayed a bauxite red colour and given a wash of black ink then dry brushed with light grey. Despite filling every available space with lead the little Wasp needs careful driving over the dead frog points on the layout. The driver figure is a Tamiya soldier civilianised with a scalpel. 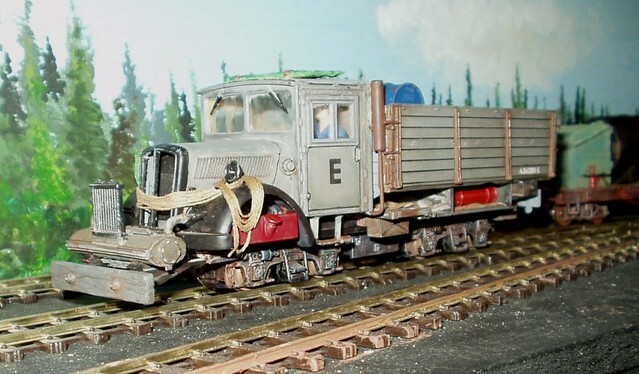 I also bodged a freelance shunter using a Hornby 0-4-0 chassis, it runs quite well given its humble origin, with a hand held feed back controller. The driving wheels are now hidden behind full skirts which improves its appearance, it is not used much but kept in reserve. 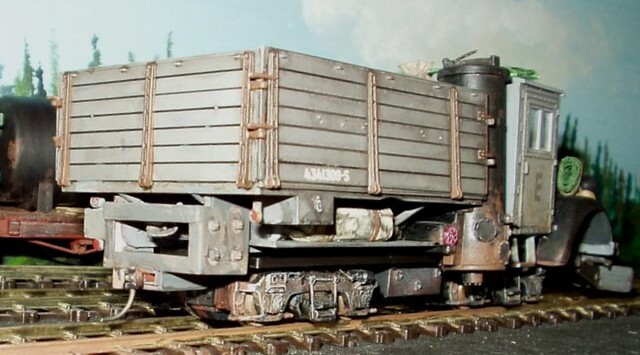 Both these locos are fitted with link and pin couplers which work very well with the Kadees. 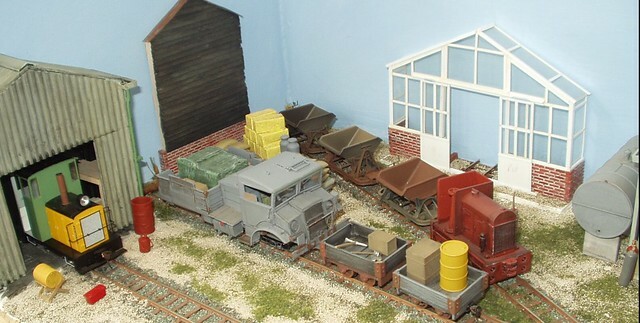 I then bought some Bachmann On30 V and wooden side tippers, which although not 1/32 look about right to me to give a bit variety to the rolling stock. Last edited by Broadoak on Tue Apr 17, 2018 8:19 am, edited 2 times in total. Flushed with the success of how well the Opel Blitz performed I started looking round for other suitable trucks to modify. A trip to my local shop yielded nothing but a look in an Italeri catalogue showed a Chevrolet short wheel base truck I thought rather attractive. I remember as a child a local farmer delivering loads of logs with one of these. I ordered one and when it arrived found it to be a little shorter than I thought it would be. Undaunted I made a chassis out of plasticard to fit an Athearn switcher chassis. I found by trial and error that I needed to lengthen the body to suit the plasticard chassis. I inserted a large toolbox box between the cab and the body. I cut out bits of the body floor, cab floor and engine bulkhead to get the body to fit over the Athearn chassis. After much cutting, filling and checking, I got it to fit. I put the model on the layout and disaster. It looked ridiculous, it sat far too high. I put it to one side and had a rethink. The photos show it just doesn‘t look right. They also show the bridge abutments and the farm road with a Fordson Major 27N tractor. The tree can be seen in its early stages before having some smaller branches then foliage added. Last edited by Broadoak on Tue Apr 17, 2018 8:25 am, edited 2 times in total. I found the answer to the powering of the Chevrolet on my next visit to the model shop. They had a Bachmann Brill trolley, which although rather crude, the passengers were printed on the windows, interested me. It had two bogies with very small wheels and a short wheelbase. It had been ordered by a customer but never collected. It ran well in the shop so I took a chance and bought it. I got it home and removed the body revealing a flat plastic chassis with two square holes for the bogies. One bogie had a small can motor and gearbox and the other end just picked up current. It ran surprisingly well with my feed back controller but was not very powerful, never mind, it didn’t need to be on Two Sister’s. With modifications to the pickup only end it fitted under the Chevrolet perfectly and looked right sitting on the track. I had to fill the hole in the centre section of the Chevy body with Milliput which added a bit of extra weight, no bad thing I always think. I then drilled and tapped the hardened Milliput to secure the chassis to the body with two self tappers. The body had a Kadee coupler fitted to the front and a few bits and pieces added to give it a bit more character. I added a canvas tilt to the body as it is used to transport tractor drivers out to the fields in the morning and bring them back again at night. Last edited by Broadoak on Tue Apr 17, 2018 2:03 pm, edited 2 times in total. 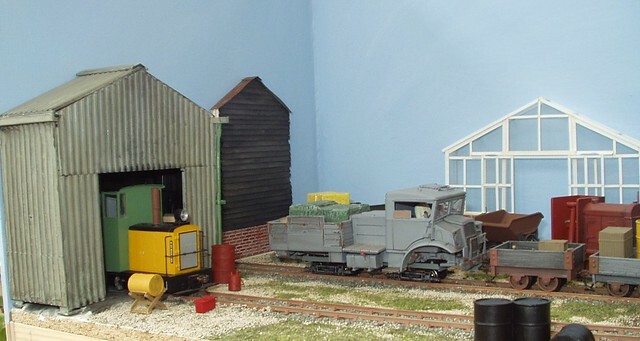 I decided to paint both the main workshop and the small engine shed a grey asbestos cement colour as I thought it unlikely that a farm would go to the trouble of painting them. Looking at asbestos buildings locally showed they had a sort of orange coloured lichen growing on some of them, easily replicated with a blob of paint. The walls were lined with balsa and some shelves put up. An Italeri kit provided a bench and many of the tools in the workshop. There are lubrication charts on the walls, these are reduced copies of the real thing. 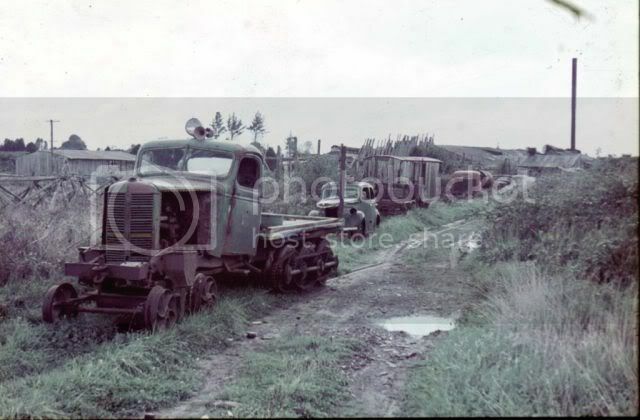 Both tractors in these pictures are actually diesels on trial and make the date the early 1960’s. 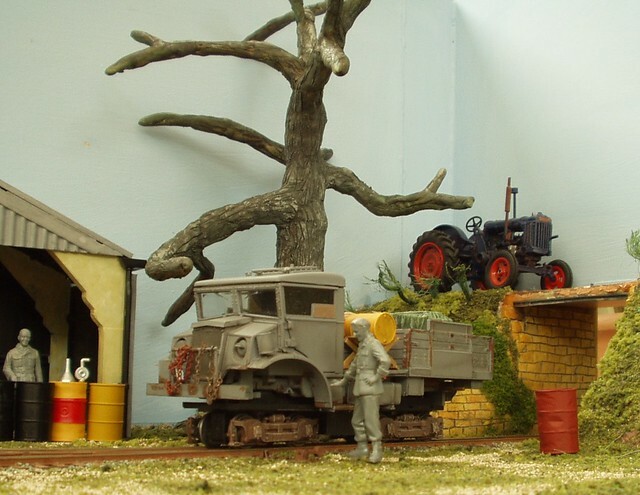 The earlier TVO (Tractor Vaporising Oil, or Paraffin) powered tractors I have are rather delicate white metal kits. I usually have an example of old and new at exhibitions. The two mechanics are Tamiya military figures that have had hats added to them then painted to look as if they are wearing overalls. The tank next to the workshop is for the storage of TVO as most tractors during the early fifties started on petrol and when the engine was warm changed over to TVO. It is made from odds and ends in the spares box. Last edited by Broadoak on Tue Apr 17, 2018 2:11 pm, edited 4 times in total. The coal stage in the foreground is a basic box shape made of Tamiya battle damaged walls cut into sections and glued with MEK. The corrugated iron is actually the inner wrapper of cup holders we use at work. I found this material by accident one morning after a holder had been left out in the rain overnight and had delaminated. It was painted with several coats of grey with a little silver paint added, when dry it was touched up here and there with various rust colours. The corrugated iron sheets are held in place with wooden corner posts and rusty wire. 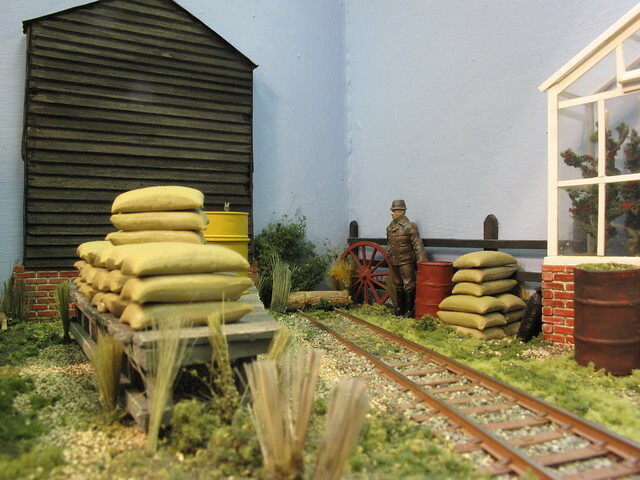 There is some crushed real coal on the loading platform which is made of coffee stirrers. A few tools are found there, shovels, a coal hammer and a pick. The coal is carried on the footplate of the only steam locomotive the farm has in small sacks. 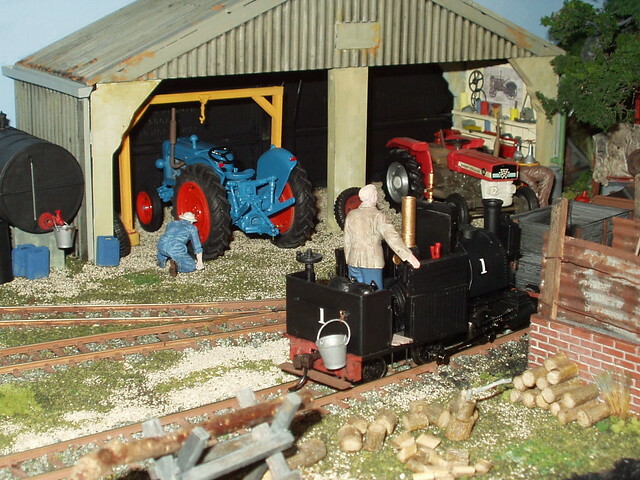 The Logs in the foreground are used for lighting up the Porter 0-4-0t during the summer months when she helps out the diesel fleet during busy periods. Last edited by Broadoak on Fri Feb 08, 2019 4:41 pm, edited 3 times in total. 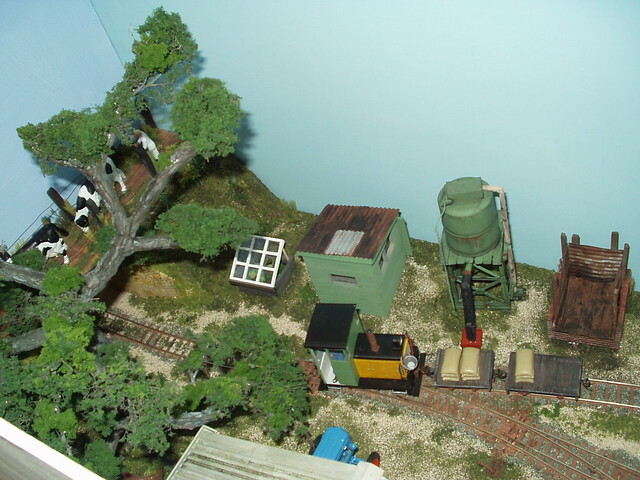 The small water tower is made from odds and ends in the scrap box mainly and parts of an Airfix bridge kit. The platform the tank sits on is a few more wooden coffee stirrers from work. The tank itself is from an HO scale re-fuelling facility. The box housing the controls is made of balsa. The other bits are an assortment of wire, chain and masking tape. The tape is used to make the leather bag for filling the loco’s tank. It is also used to simulate the lagging on the rising main which feeds the tank. These are painted in appropriate greyish brown colours. The main parts being painted with Humbrol oil paint in a colour I mixed myself which I call industrial green. Last edited by Broadoak on Tue Apr 17, 2018 2:19 pm, edited 2 times in total. 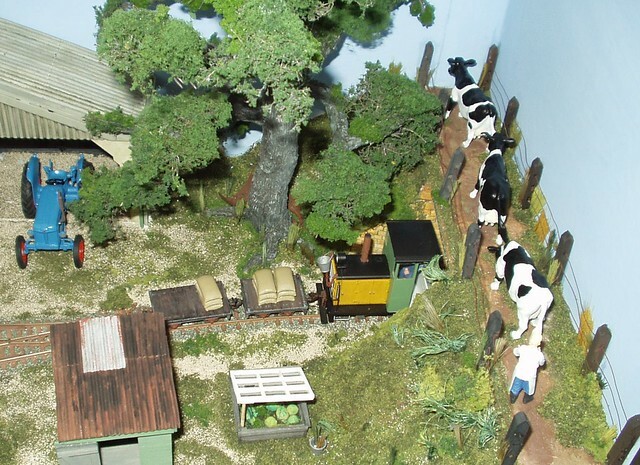 The bridge with the cows being driven over for afternoon milking hides the fiddle yard entrance. The cows are actually Britain’s Jerseys, but a farmer friend told me they look more like Friesians, they are too big and the wrong shape for Jerseys. So I re-painted them by spraying them white then painting on black patches in a random fashion. I finished them off by painting the udders a very pale pink and touching in their eyes, noses and hoofs. The cows are clean at the rear end as it is summer. They only get really mucky in winter when they have to be kept inside. Last edited by Broadoak on Tue Apr 17, 2018 2:20 pm, edited 2 times in total. I did have a tractor rivet counter at a show once. He noticed the tractor oil charts on the wall in the workshop and thought they were incorrect. They are not; I copied them from an actual Fordson manual. 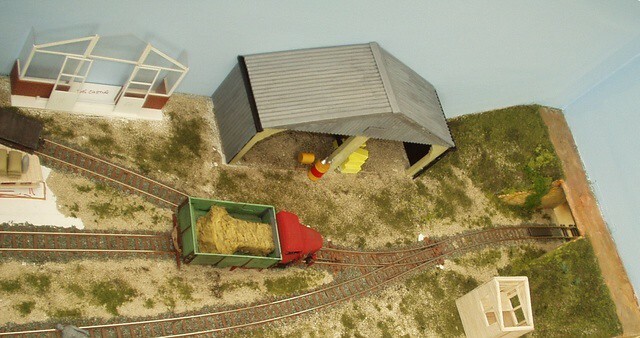 The foreman’s hut/office is a scale model of the huts we used to have at work. It is made of strips of balsa wood with a corrugated iron roof, the same material as the coal stage sides. The door is set in the open position to show the interior detail. There is a small stool and a bench with paperwork, a mug, a clipboard hanging up, and some bread and cheese. The foreman figure is a modified Tamiya German soldier. Last edited by Broadoak on Tue Apr 24, 2018 12:07 pm, edited 1 time in total. The cold frame itself is a mix of balsa and plasticard with the vegetables being made of Milliput and painted with green acrylics. One of the panes of glass is broken, a bit hackneyed I know, but the children seem to like it. The Davenport in as new condition is seen passing with a nominal train of sacks of wheat. The farm grows potatoes, wheat and sugar beet and rotates the crops annually to prevent disease. It also keeps cattle, sheep and pigs the manure being used to improve the soil. The Davenport when purchased was fitted with the DCC gubbins. This has now been removed and a blanking chip put in and this has transformed its running for the better. When these photographs were taken only very slight modifications had been done. The cab height had been increased to clear a standing 1/32 scale figure. The control cluster in the cab was raised and a couple of handrails added and the model lightly weathered. Since then a few more changes have been made. An air cleaner and fuel filler have been added to the bonnet top. In the cab a reversing lever and brake wheel have been added, these can’t really be seen but I know they are there! It has also had a bit more weathering added to give a work stained appearance. Last edited by Broadoak on Wed Apr 18, 2018 5:13 am, edited 2 times in total. A couple of pictures of the other Bachmann On30 model I have. The Porter 0-4-2t steam loco is the only steam engine on the roster. I must confess to being an unashamed internal combustion engine fan. The Porter has been modified very slightly. It has had the cab removed and the cab sides built up a little. 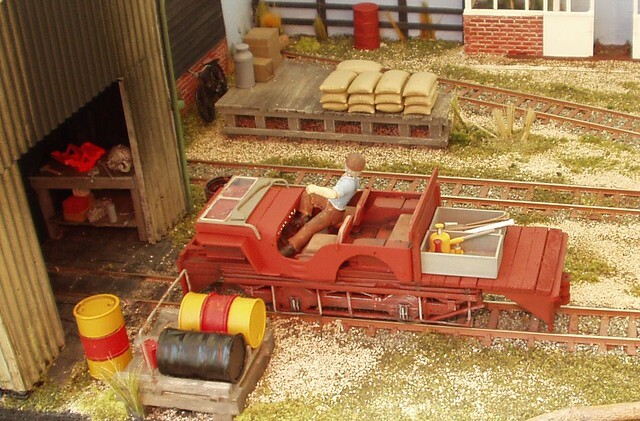 A reversing lever, a hand brake wheel and a bonnet for the safety valve have also been added. The driver is an ex-German soldier. In the second picture the locomotive has been lightly weathered. I usually apply weathering a little at a time, adding a bit more is easier than removing it if you have overdone it. I must admit I am not overly keen on this model, to my mind the boiler looks too small. I don’t know why but it doesn’t run as well as the Davenport so it tends not to get much use. Last edited by Broadoak on Wed Apr 18, 2018 5:23 am, edited 2 times in total. The farm estate Two Sisters’ is very loosely based on had some twenty odd miles of main line and ten miles of sidings all of it two feet gauge. It had a connection with the GER and a facility for loading the crops (mainly potatoes) into Lorries as well. They had an assortment of Simplex locos really and ex First World War rolling stock. I felt the need to build something that could be used to haul these main line trains to the railhead or road interchange. That is how the yellow beast came about. 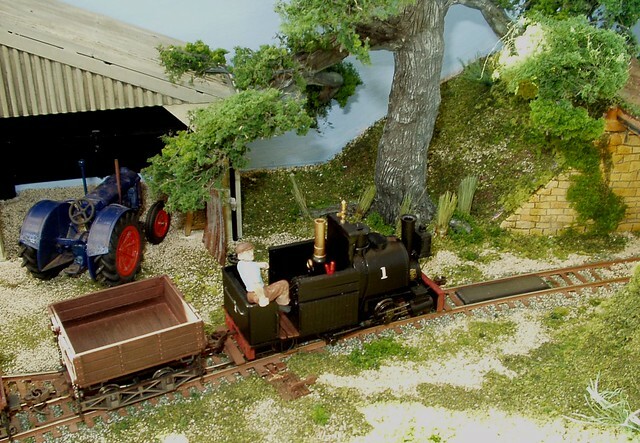 It is totally freelance and is supposed to have a Gardner four cylinder diesel engine which drives a small generator which in turn powers the rear bogie which has two traction motors. The front bogie is un-powered and is purely for load carrying and braking. All this is fiction of course. 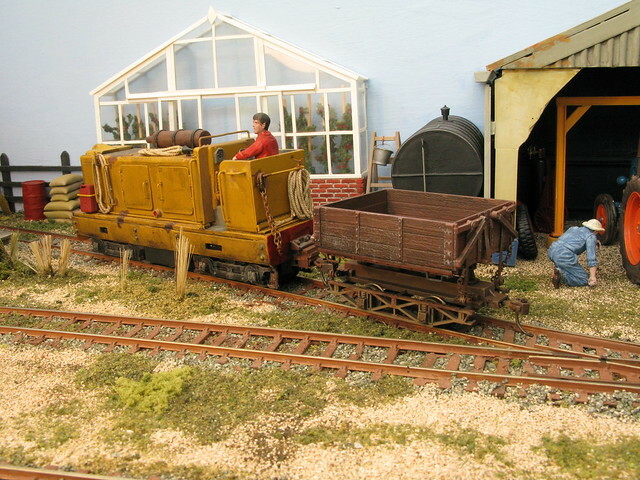 The device is seen here with a side tipper used to transport lime out to the fields to improve the soil. The model runs on another Athearn switcher chassis, this time with the rear drive shaft disconnected to give a bit more room in the cab area. The body has bits of its original donor loco, a Baldwin S12, with the cab removed and doors and handles on the bonnet sides added. The cab like the tractors of that time is open to the elements. The driver is a converted army figure with his tin helmet filed to look like his hair. The beast is seen here with a wooden side tipper on its way to the piggery to collect the material from mucking out the sties. A single track ran through the area to facilitate this. Last edited by Broadoak on Thu Apr 19, 2018 5:01 am, edited 5 times in total. 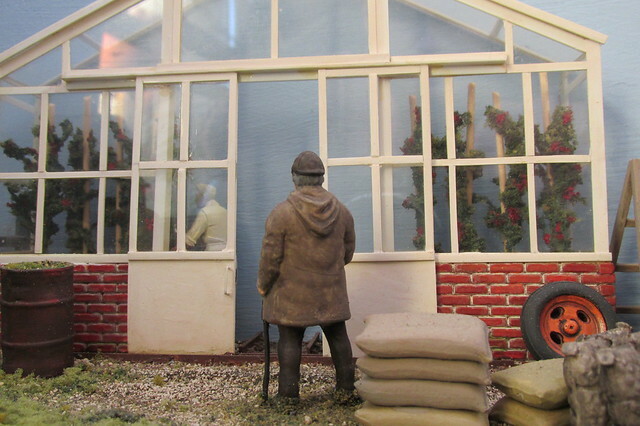 A view showing the greenhouse as seen in Summer with the tomato plants being tended by a man with a white apron. They are made of a cocktail stick for the cane supporting the plant. The actual plant being thin wire covered in PVA glue then dipped a mix of green flock material. When it had all dried a dab of bright red paint was applied to replicate the tomatoes. Last edited by Broadoak on Wed Apr 18, 2018 10:50 am, edited 4 times in total. I feel I ought to come clean about the photographs. As a general rule if the photo is of good quality with a high number of pixels, my good friend and fellow operator Andy Knott took it. If the picture is of poorer quality and a lower number of pixels, I took it using my wife‘s compact camera. There I feel better now having confessed. Last edited by Broadoak on Wed Apr 18, 2018 10:54 am, edited 4 times in total. I find 1/35 is a nice size to work in for someone like me who is not in the first flush of youth. These days my eyesight is not what it was and my hands don’t seem so dexterous as they once were. The main thing is it is fun. 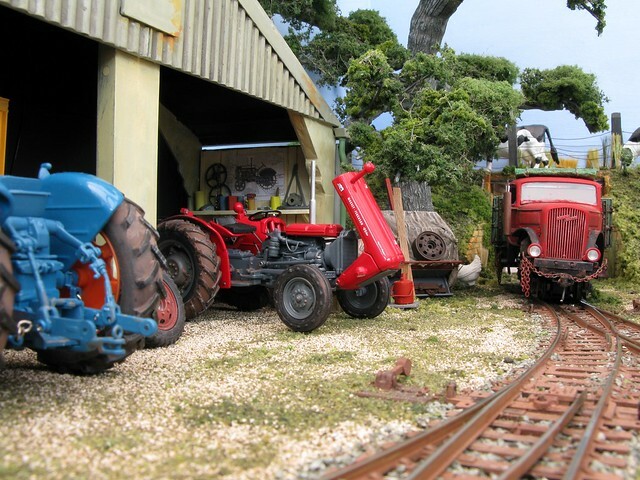 We get a glimpse into the engine shed with its work bench and a tool box plus some parts being worked on. A vice and more tools have been added since this was picture was taken. The floor of the engine house is scribed Milliput painted a dirty black as are the sides of the rails in the shed. 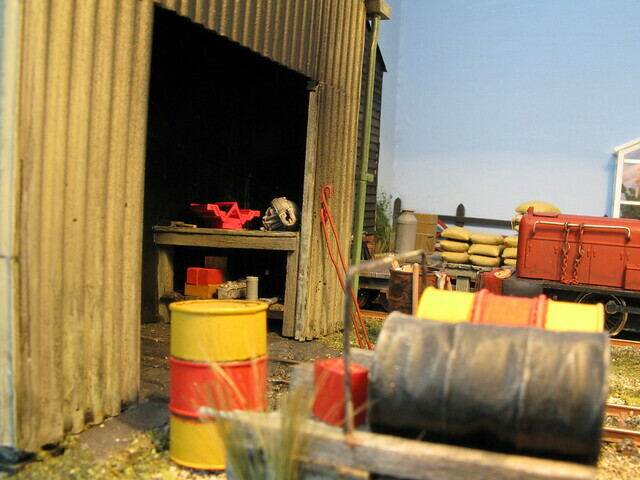 A set of fire irons lean against the front of the shed next to an oil drum of rubbish complete with brush and shovel. A group of oil drums containing lubricating oil sit on a balsa wood stand. Next to the engine house is a low relief barn made of balsa painted with watered down Indian ink. It has a rusty corrugated iron roof and a brick base from yet another Tamiya war damaged building! Last edited by Broadoak on Thu Apr 19, 2018 5:02 am, edited 3 times in total. I found another 1/35 scale truck kit of an earlier Opel Blitz, a bit more thirties than forties looking. It was in fact a gas producer. The long vertical tank shape on the right hand side was used to heat either coal or wood chips and the gas given off was collected in a pipe and directed round to the front of the vehicle. Here it passed through a radiator which cooled it then it was stored in a large tank fitted crossways to the front of the truck. The gas was then fed into a carburettor to power the engine. It produced about 40% of the power that petrol would apparently. It could run using petrol as well in a conventional way if required. Last edited by Broadoak on Wed Apr 18, 2018 8:46 am, edited 3 times in total. This time I managed to get it to fit over a Con-Cor switcher chassis. 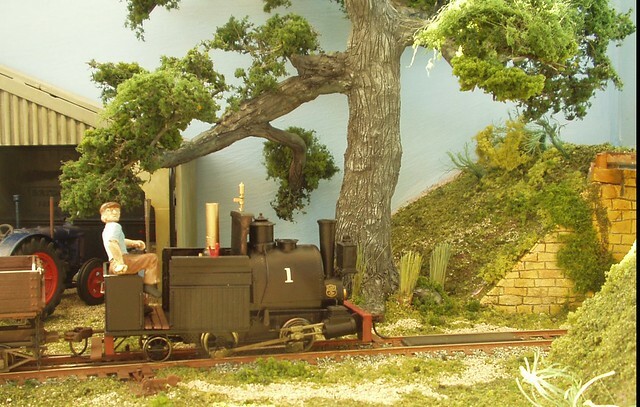 It is very similar to the Athearn but with a can motor. It came out of a loco I’ve had for years but never really liked because of its awful over scale hand rails. This time to get it to fit meant removing a flywheel and drive shaft to fit under the cab and bonnet. The body is held in place by two self tappers each side that press against the sides of the motor. A large tarpaulin covered box in the back hides the motor and drive mechanism. I sprayed it with grey car primer then picked out the wings and radiator outer cover in black. I washed the whole body with a mix of black ink and grey acrylics to tone everything down a bit. The driver is a modified military figure. I then added ropes and chains and a few oddments in the back to make it look more interesting. 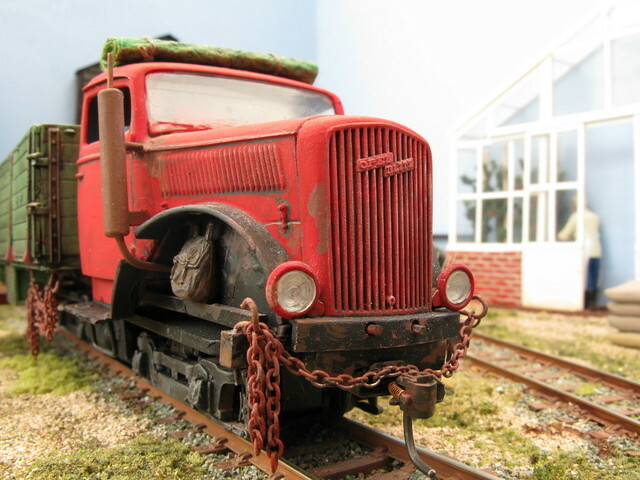 Originally it was fitted with a Kadee coupler at the front but because the rail truck is rather longer than the other Opel Blitz it swings out too much and was a menace in the yard. The truck has now been demoted to taking fuel, spares and general running about on the estate. Last edited by Broadoak on Wed Apr 18, 2018 8:47 am, edited 3 times in total. The next rail truck I built really is a bit of a critter. It is an ex- American army jeep. It is an Italeri kit and was about six Pounds. I didn’t realise until I got it home and looked in the box that it came complete with a trailer as well. Excellent value I thought. It sits on an On30 Bachmann Street Car chassis, which is rather high, but the Bachmann chassis was brand new and only £20 so I am prepared to put up with the extra height. A couple of pictures taken in the early days before the jeep was fully detailed or weathered. The ground cover was still being added a bit at a time at that stage. The horse drawn device hidden under the tarpaulin is actually part of a German army field kitchen. The tarpaulin is kitchen towel soaked in PVA, then painted with acrylics when dry. This is then washed over in a thin coat of watery dark grey, this runs into the creases and gives it more definition. When this is dry a light flick over with a little cream on a dry brush. Like this the implement could be anything. Wonderful thing the imagination. Last edited by Broadoak on Wed Apr 18, 2018 8:53 am, edited 2 times in total.